Greece Soccer Team - EURO 2004 Champions - Panagiotis Fyssas - by La Cancha-News On World Cup 2006 - "World's Leading Soccer Magazine!" An uncompromising left-back, Panagiotis 'Takis' Fyssas is a regular for club and country who regularly catches the eye with a stream of excellent, full-blooded displays. He gained international recognition in a 2-1 victory against Finland on 3 February 1999, subsequently taking his place in the squad in qualifying for the 2002 FIFA World Cup and the 2004 UEFA European Championship. Having started the opening-day defeat by Spain, Fyssas was a substitute in the next four qualifiers - twice coming on - before being restored to the first XI because Stelios Venetidis was suspended, for the 1-0 victories against Ukraine, Armenia and Northern Ireland. A product of the Panionios GS youth academy, Fyssas made his senior debut in the 1990/91 season and by his 20th birthday was a first-team regular. In his ninth campaign with the club, aged 25, Panathinaikos FC opted to sign him on a five-year contract. 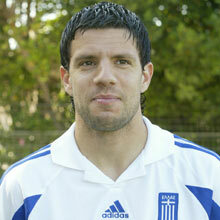 1999: Things have not been simple for Fyssas since he arrived at the Apostolos Nikolaidis stadium. When Yiannis Kyrastas joined Panathanaikos as coach in 1999, it revived memories of a major difference of opinions between Kyrastas and Fissas at Panionos, but happily both put their differences aside and the club have been rewarded. He made his UEFA Champions League debut in the 2000/01 season and amassed 23 European appearances over two years. That form continued into 2002/03 as Fyssas played every match as Panathinaikos reached the UEFA Cup quarter-finals, scoring the decisive goal which eliminated FC Slovan Liberec en route. 2003/04: Played nine matches for Panathinaikos before being dropped when it emerged that he was to join SL Benfica when his contract expired in December. Played 14 SuperLiga games before scoring the equaliser in the Portuguese Cup final which paved the way for Benfica's extra-time defeat of FC Porto. He did not initially win over the coaches at the Panionios youth academy, only doing so after staying for hours following training to hone his skills.